This is a reminder that our next Irish Genealogy Essentials course is coming up soon and there are still places available. It is a 5-day course and runs from 5 to 9 November 2018. We have two other 5-day courses scheduled - 4-8 February 2019 and 7-11 October 2019. There are also two 1-day courses scheduled - Monday, 19 November 2018 and Saturday, 19 January 2019. 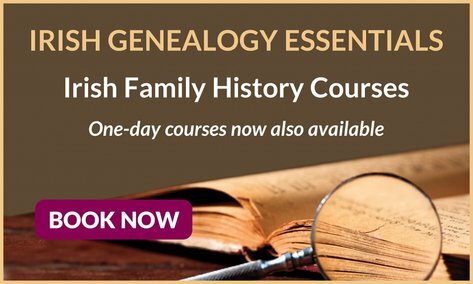 Click here for more information on our family history courses. We are also offering a new programme - Irish Family History Experience: Introduction to Irish Family History - which will appeal to both the budding family history researcher wishing to make the first step towards research success as well as the dedicated family historian wishing to break down those genealogical brick walls. Places can fill up fast so reserve your place now for only £729.99 per person (or with a deposit of £350 per person). Given the current low value of sterling (GBP) against other currencies now is a particularly good time for overseas visitors to purchase. The present exchange rate values will ensure overseas delegates can make a very tidy saving on the cost. To mark the recent publication by the Ulster Historical Foundation of Exiles of ’98: Ulster Presbyterians and the United States by Peter Gilmore, Trevor Parkhill and William Roulston, PRONI will be holding a half-day conference on Thursday, 8 November 2018, from 2.00pm to 4.30pm. The conference will examine the events of 1798 in the north of Ireland, the experiences of those who left Ireland after the Rebellion and look at the wider context of Presbyterian migration from Ireland. Speakers will include Dr Linde Lunney, Peter W. Murphy, Trevor Parkhill and Keith Beattie.